Before loading your programcodes on the Ozeki Processing Modules you need to burn a bootloader on the ATmega328P chip of each module. Bootloaders are necessary for uploading your codes. They are usually installed by factory default but if you are a manufacturer or a hobbiest who has just built an Ozeki module, you will need to burn a bootloader on it. 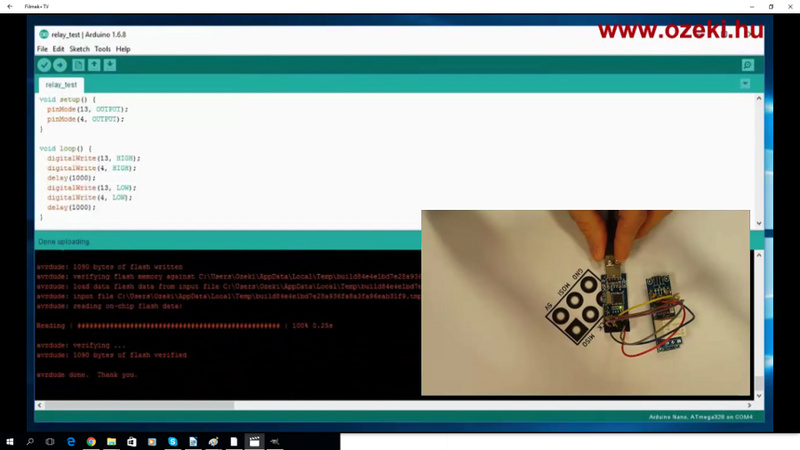 First you need to download the Arduino IDE (Figure 1) and install it on your computer. Then you need to download the drivers for the ISP programmer which you can buy online. Download (usbasp.2011-05-28.zip) driver directly from Ozeki or you can find the latest version of the driver on the official website (.tar.gz). Before installing the driver you need to restart your computer with disabled driver signiture enforcement. When the computer is up and running plug in the ISP programmer, open the device manager and add the USBasp driver to your programmer. Now that the hardware is set up the most important step remains, burning the bootloader onto the ATmega328P microcontroller. To do this please start the Arduino IDE and configure it. At the top 'Tools/Programmer' menu please select 'USBasp' and click 'Tools/Burn Bootloader'. If everything went fine in the log window you should see a message that it is done (Figure 2).